Replace air operated diaphragm pumps to reduce air consumption and electricity costs. Menasha, WI based DuraFibre manufactures industrial packaging and heavyweight folding cartons for a variety of packaging applications. The 75 year old company uses industrial adhesive as part of its manufacturing process. Rising energy prices and heightened concern for the environment have forced many companies to rethink their pump technology needs for process applications. Dura-Fibre contacted Wastecorp to replace its AOD pump systems in favor of mechanical diaphragm pump technology with energy efficient motors. The pumps are used to transfer process industrial glue on 24 hour cycles at an average of 60 GPM at 120°F. Wastecorp recommended the Mud Sucker 3B professional diaphragm pump series for Drua-Fibre’s needs. The 3B Series features both a suction and a discharge check valve to enhance the flow of thicker slurries or substances. The Dura-Fibre pumps feature a 13” OD TPE diaphragm to manage higher fluid temperatures, 4.5” urethane ball valves and cast iron valve seats. With a 3 hp, 3 ph high efficiency Siemens motor, Dura-Fibre is able to pump up to 80 GPM. 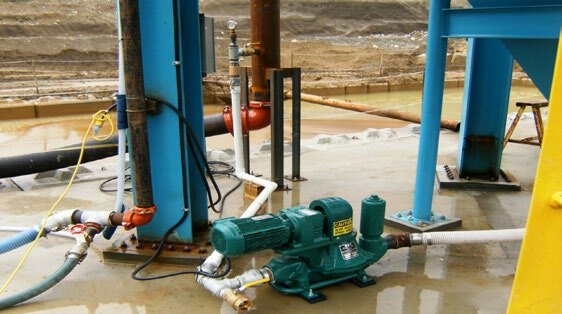 Energy costs for Mud Sucker pumps range from 40-60% less when compared to air operated diaphragm pumps. Plus, all of our Mud Sucker’s are available with Xylan internal coatings to help improve the flow of sticky fluids like glue. Contact us today to find energy efficient pumping solutions for your facility. Industrial adhesive pumping systems like the Mud Sucker B Series are available with Xylan internals to help improve the flow of thicker liquids.